The third Kathleen Whyte Memorial Lecture was given by Sarah Burgess on Saturday 18 November 2006 at Dewar’s Centre, Perth. g’love stories is part of my continuing fascination with hands, both as a sensory tool, a conduit through which we solve problems, create, destroy, signal and experience the world, and as an expression of the aging process. For this exhibition I collaborated with Tameside Museums and Galleries Service and developed ideas from the historic glove making industry that flourished in Hyde, Cheshire until the end of the 20th C.
I have worked with the Museum’s collection of glove making artefacts, as well as collecting the memories of older glove makers from the area. Gloves are a temporary skin covering hands that are rarely still; resting, working, fiddling or caressing they betray age and life’s experiences. After long usage leather gloves retain the image of our hands, stained, torn, mended and discarded, rediscovered, they contrast with pristine, unworn gloves recalling youth and inexperience. The space between the two sets of gloves is a life, full of growth, play, work and caring. Hands hold, stroke, draw, stitch cut and wash and life’s experiences leave their cumulative marks. During earlier times gloves were in turn, symbols of power, authority, gifts, favours, social indicators and fashion statements, fingerless lace mittens were worn indoors and until 1960’s women were rarely seen outside without gloves whatever the season. Today, gloves are folded away to be worn in cold weather. Glove drawers contain our second skins. These gloves are a narrative symbol, sequences of gloves whispering life stories to those who bend to hear. In my work I combine drawing, mixed media and stitch to explore both concept and textile technique, whilst my limited range of materials are selected to be strongly contrasting in weight and character to emphasise both fragility and strength. Colour is used symbolically to reinforce my ideas. 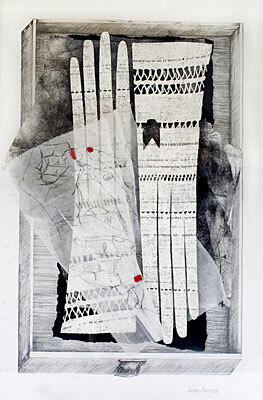 I frequently work with open structured materials, withdrawing and manipulating threads, making reference to the time consuming techniques and characteristics of traditional drawn thread work with it’s associations of domesticity and respectability. The many traditional sayings associated with hands and gloves have been a source of delight, leading to visual and written puns and play on words.